"I like the idea of saying something very complicated in a very simple way," Ben Miller states. "That's what we strive for musically, and what I strive for lyrically—to get directly to the point." Getting to the point is something that the Ben Miller Band does consistently on Choke Cherry Tree, the Joplin, Missouri-bred combo's third album and second New West release. The consistently compelling set offers 11 new examples of Miller's deceptively unpretentious songcraft, beneath whose ramshackle exterior lurks sturdy, infectious melodies and resonant, emotionally insightful lyrics. Miller's band delivers such memorable new tunes as "Nothing Gets Me Down," "Akira Kurosawa," "Trapeze," "Lighthouse" and "Mississippi Cure" with the sort of unpretentious enthusiasm that's already won the group a devoted fan base that stretches from the band's midwestern home turf to the U.K. and Europe, where they've toured to rave reviews. Choke Cherry Tree introduces a retooled Ben Miller Band lineup, with Miller and fellow founding member Scott Leeper joined by new additions Rachel Ammons and Smilin' Bob Lewis. The pair's multi-instrumental skills bring added authority to Miller's rootsy new compositions, while maintaining the high energy level (complete with homemade instruments constructed from broken and discarded axes) that originally endeared the band to its fans. Elsewhere, Rachel Ammons' expressive vocals lend depth to the haunting "Redwing Blackbird." According to Miller, "Early in the process of making this album, I thought that we either had to really nail our live approach in the recording studio, or we needed to forget about that and just work on capturing the songs in an inventive way that presents them in their best light. We decided on the latter approach, and we never looked back." Indeed, while Choke Cherry Tree maintains the rough-and-ready vibe of the band's prior releases, the new material also features some of the most carefully-crafted arrangements that Miller and company have ever had. "This time around," Miller explains, "I did more demos than usual, and really hashed out the songs at home, which gave me and Chris a really good starting point to work the songs. It was the opposite of just jumping in and playing and trying to capture it on the mics. Even though there was more collaboration with other people on this album, it's probably the least compromised album I've ever made." Since its formation in 2004, the Ben Miller Band has staked out an iconoclastic niche that's established them as both a one-of-a-kind creative unit and a grass-roots fan favorite. Channeling a century's worth of far-flung American musical influences into rousing songcraft that radiates with smarts and soul, Miller's tunes achieve a musical and emotional depth that belies the material's (and the musicians') rough exterior. The hard-working unit first won a regional fan base through old-fashioned ingenuity and an unstinting work ethic, generating a national buzz and a high-profile 2013 tour of Europe with ZZ Top, thanks to the patronage of avowed BMB fan Billy Gibbons. The Ben Miller Band's early D.I.Y. approach extended to the lo-tech, largely self-built, instruments that the members still play on stage, including Miller's thrift-shop guitars and banjos and Scott Leeper's one-string washtub bass. The band's use of offbeat instrumentation, however, shouldn't be misunderstood as a gimmick. "What I really care about is songs, and the rest of it is just a vehicle to get you to that destination," Miller asserts, adding, "We have no interest in being some kind of wacky novelty act, and just because we use junk to make music doesn't mean we aren't serious about it." Growing up in rural Curlew, Washington, Ben Miller began playing guitar at 16, turning his back on a promising career as a visual artist to focus on music. He gained experience busking and performing in open-mike nights while road-tripping around America, and during an extended stint in Eastern Europe. He eventually found kindred spirits in Scott Leeper and original BMB drummer Doug Dicharry. The three like-minded players joined forces, and before long their diligent touring regimen allowed them to conquer an ever-widening fan base. In 2012, the Ben Miller Band took its first tentative steps in the recording studio, resulting in the self-released CD Heavy Load, which attracted a good deal of fan praise and critical acclaim. Word of the BMB's charismatic live shows and regional popularity eventually began to generate a national buzz, winning them a spot on New West Records' roster. The band made its New West debut with 2014's Any Way, Shape or Form, recorded in Nashville with renowned producer Vance Powell. 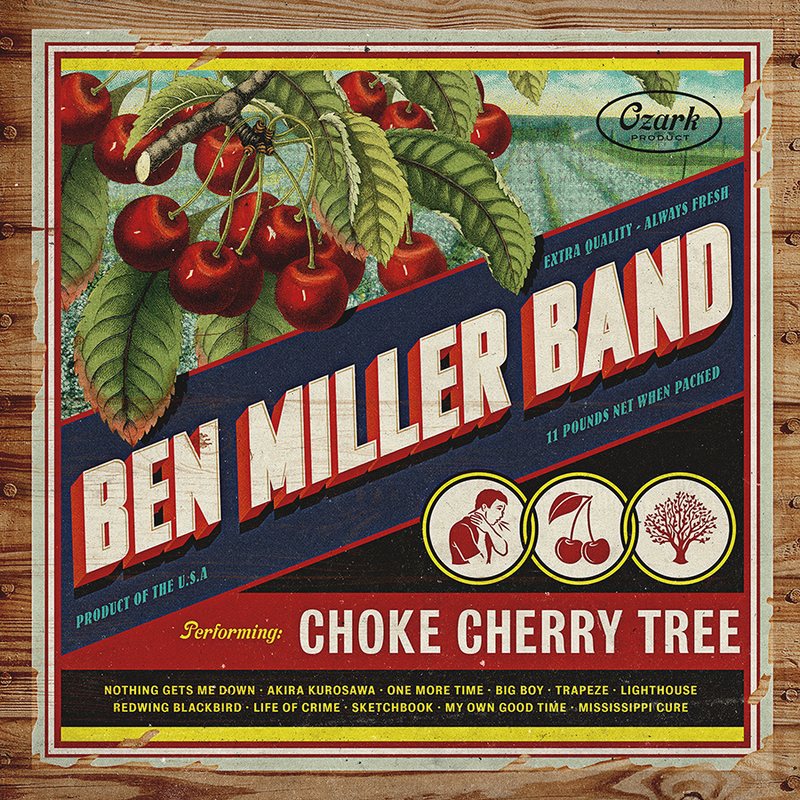 Now, with Choke Cherry Tree ready for unveiling, Ben Miller is enjoying his band's new four-person lineup. "The audiences seem to like it as much as ever," he observes, adding, "Our two new members are great and exude personality from the stage, so I feel like we're an all-star band now. I love having a female presence on stage, which creates a different energy that you can't get with just dudes. I think it adds a tension that's different, but we're still high-energy on stage, and we still play crazy instruments and move around a lot." Miller is careful, though, not to allow the novelty of the band's homemade instruments to overshadow the more substantial aspects of the band's output. "If our only selling point was 'Come and check out the weird instruments,' it would get old real fast," Miller states. "It got us in the door, but once we got in the door, the songs became our focus. Where I put most of my energy is trying to serve the songs, and trying to make them as good as they can be."